Ikat making refers to the tie-dyeing method which gives the textiles their unique vibrancy of colour and design. Ikat is an ancient technique, a method of wrapping yarns to form areas of resist, and then dyeing these sections of yarn before the weaving of a cloth begins. Ikat making is well known in many parts of the world – Southeast Asia, Japan, the Yemen, South and Central America – all have strong traditions of ikat production. Making a hand woven ikat was practiced in a very simple form for centuries in Central Asia. Then, during a hundred-year-long cultural and economic revival in the oasis kingdoms, the art of ikat waving became the most vital, sophisticated and widely distributed textile art in Central Asia. Taking into account the complexity in the manufacture of ikat, the fabric was available only to quite prosperous people, since the result it was a rather expensive fabric. It was believed that the wearing of ikat products brought prosperity and wealth to those who could afford ikat products. 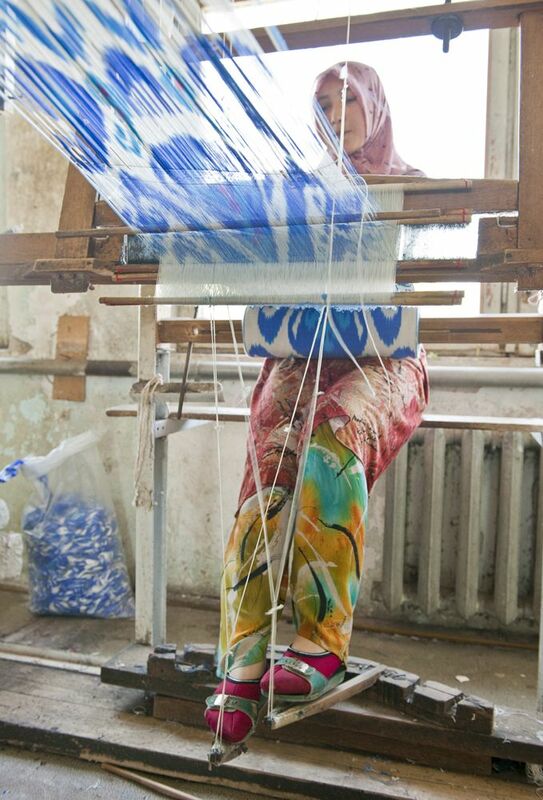 In Uzbekistan, there are three types of dyeing in the technique of ikat – from silk, cotton and viscose. Ikat from silk is called adras, where both silk and cotton threads are used, forming an ikat pattern. But, if the fabric is entirely made of silk, then it is called silk adras. And cotton ikat is called calico or cotton ikat. 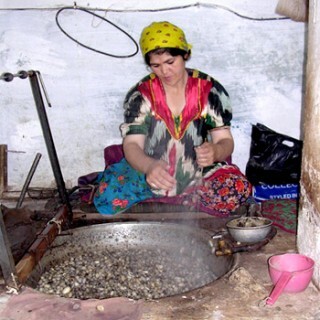 Local craftsmen also make the so-called silk ala-bahmal – fabric with a nap. Each thread of yarn can be dyed and dried up to three times. Primary colors of dyes – yellow, red and blue. Before each stage of the coloring process, the master must tie each strand in order to protect the areas that are not supposed to absorb this dye. The ikat technique was used in other places, but in Central Asia it was in a special way. Here the fabrics were the brightest: colors resembling precious stones, with very clear patterns. Nowhere else in the world can you see this miracle. The ancient cities of Central Asia, located along the northern Silk Road, for centuries been famous for the production of luxurious weaving products. As for the Ikat, their main production began in Bukhara and spread to Samarkand, and then to the Fergana Valley. 1. Making silk thread. 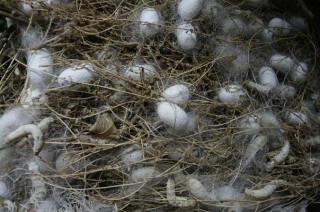 The most common method of reeling was to toss the unsorted cocoons into a cauldron of boiling water to dissolve the sticky sericin, then cocoons were brushed with a stick to which the separated filament end would adhere. Then the filament ends were drawn from the pot and wound by hand into loose skeins. As the individual silk filament is fine, several were combined to make a usable thread. 2. Preparing the wrap. The thickness of the warp thread and the number of threads in a warp were dictated by the fabric to be woven. A single craftsman used to twist the silk threads for the warp on a giant wheel, and then the threads were taken from the bobbins and wound carefully. The warp was boiled for ten min in a potash solution to make it white and firm. After being rolled, the excess water was squeezed out from the threads. 3. Tying the wrap. The tying of ikat requires two specially skilled craftsmen. One is a pattern designer, who makes the warp for the design and the other master, who actually bound the warps. 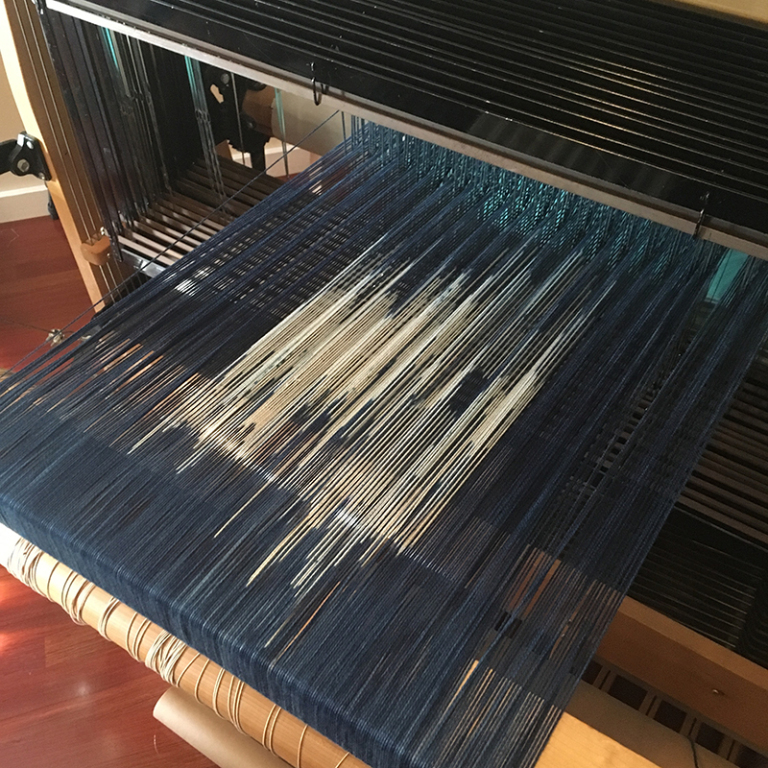 This stage includes a hard work starting from passing the warp through the openings in a special board and ending with giving the first dye bath. 4. Dyeing the tied warp. In the making of ikat, the dyeing requires the most care, as it is essential to maintain a cohesive and beautiful pattern though a succession of dye baths. The dyer’s workshops were primitive and roughly built. The sign of the craft consisted of a scrap of cloth or hank of yarn dyed and hung at the entrance. The masters of the hot dye shops supervised several workers: one ground the dyestuffs, two others dipped the heavy, wet fabrics and warps, and another watched the fires. 5. 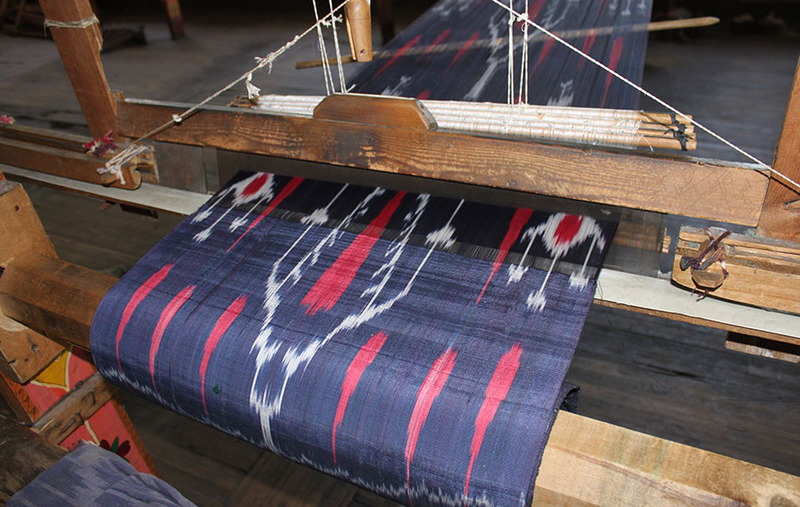 The weaving of ikat. All the ikat warps were woven in fairly narrow strips of between 9 and 24 inches (24-60cm) wide. Given the lengthy dyeing sequence and the complex adjustment of the warps in the loom, the weaving of a standard warp length of adras ikat, using the traditional hand loom, probably required between one and two months to complete. 6. Finishes applied to ikat fabric. When the completed ikat was cut from the loom, the final step was to give the fabric a brilliant, reflective shine. The surface of the fabric was made shiny by the application of egg white or a special glue, or by thumping the surface with a wooden mallet. Naturally, after such laborious work, something amazingly beautiful and of high quality was created, which was an expensive pleasure. However, today, the whole process is more automated and requires less human cost, but despite this, the result of the work inspires many people and ikat holds the highest positions in the global fabric market. This entry was posted in Fashion, Home + Decor, ikat fabric. Bookmark the permalink.